These little bears have movable legs, arms and head and are so cute. You can often find them available at dollar stores, which keeps the cost very reasonable. 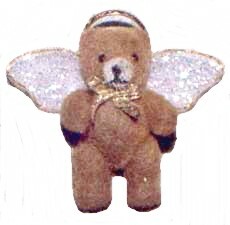 Add wings and a halo, and you’ve made beary cute angel buddies that make great little Christmas favors. I made these little bears to add as favours to my Christmas crackers. They only take a few minutes to make. Glue wings to the back of the bear, then glue the halo on top of the head. Add a ring of glue around the halo at the back to help secure the ring. When these pins are exposed to outdoor weather, the cold may cause the metal of the ring to separate from the bear. Adding a ring of glue around the ring, touching both the ring and the bear, will keep it secure. Glue a small bow to the bear’s neck and glue a jewelry pin to the back. The pins have holes in the plate that attached to the bear. Be sure to allow the glue to fill these holes and slightly spill over the holes. This helps to keep the metal from separating from the bear. Copyright © 1999-2010 Susan Spatone All rights reserved.